A special livery, SC-Project exhaust with a dedicated ECU control unit and the forged aluminum wheels are the finishing touches given to the Dragster 800 RC by the MV Agusta Reparto Corse engineers. 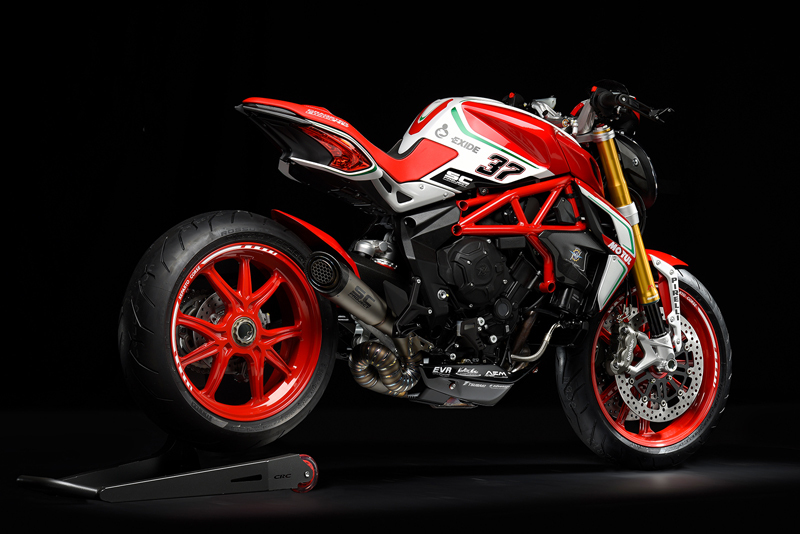 REFINED ELECTRONICS: The Dragster 800 RC features the latest evolution of the MVICS system. On top of full multi-map Ride By Wire, it has an 8-level traction control system and a sophisticated EAS 2.0 electronic up & down gearbox mated to a hydraulic slipper clutch. The electronic injection system has two injectors per cylinder with three 50 mm diameter throttle bodies. COMPACT, WITH A COUNTER-ROTATING CRANKSHAFT: With its 52 kg and its contained dimensions, the three-cylinder of the Dragster 800 RR is the ideal choice to optimise the distribution of weight. 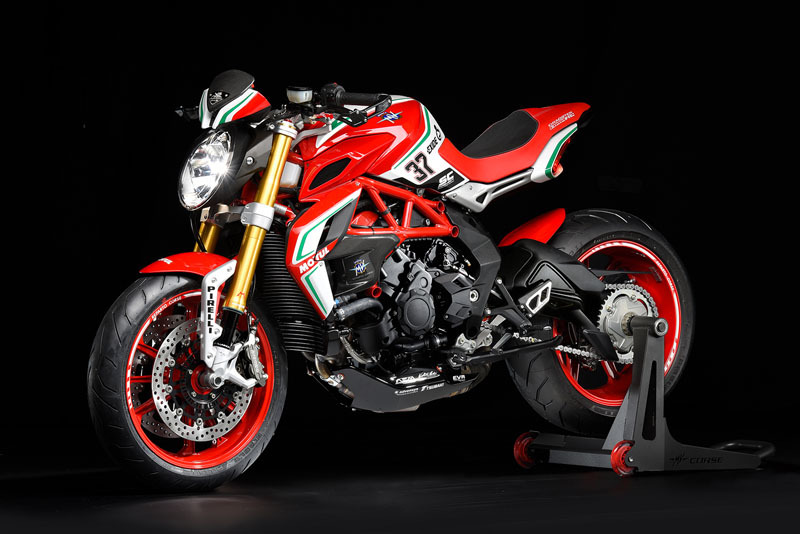 The counter-rotating crankshaft is key to enhancing its dynamics, whilst its incredible performance is due to the new design of the airbox and the improved exhaust. EXTRAORDINARY POWER: The three-cylinder engine powering the Dragster 800 RC develops 140 Hp at 13.100 rpm and a maximum torque of 87 Nm at 10.100 rpm, with a fluid delivery at lower revs and an extraordinary acceleration harnessed only by the rev limiter stepping in at 13.200 rpm. MAXIMUM SAFETY FOR TOTAL RIDING PLEASURE: When there’s nothing else to worry about than riding pleasure, fun is at its top, especially when your safety is guaranteed by a Bosch 9 PLUS two channels ABS system with Rear Wheel Lift-up Mitigation. The RLM system shoots in to mitigate excessive braking action on the front wheel and avoid rear-wheel lift. SIGNATURE: Even in this version, the Dragster remains true to itself and is immediately recognisable. The cut tail, the aggressive handlebars and the huge rear wheel are packaged in an exclusive livery enhanced by the all front fork’s dedicated colour. FEATURE: The weight distribution, the refined chassis and suspension as well as the Dragster’s unique character are the main features of a machine that was created for the most demanding enthusiasts. 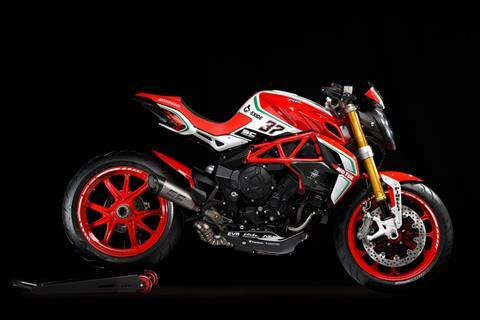 MV REPARTO CORSE DNA: A special livery, SC-Project exhaust with a dedicated ECU control unit and the forged aluminum wheels are the finishing touches given to the Dragster 800 RC by the MV Agusta Reparto Corse engineers. FROM 0 TO 100 IN A INSTANT: The engine’s stunning performance, as well as its precision, further enhance the riding pleasure. An exhilarating experience, and the perfect combination of form and substance in this quintessential motorcycle. At the crankshaft - 150 hp (110 kW at 12,800 rpm) - Limited power versions available on demand.